The 2010 Section SR-7A conclave was hosted by Tutelo Lodge 161 at Camp Powhatan on April 23-25. The pocket patch issued for the conclave features a complex design of an Indian standing in front of a fire with a lodge in the background, and woods, mountains, and a sunset all reflected in a lake. Ghosted into the design are the numbers of the lodges that comprise Section SR-7A. 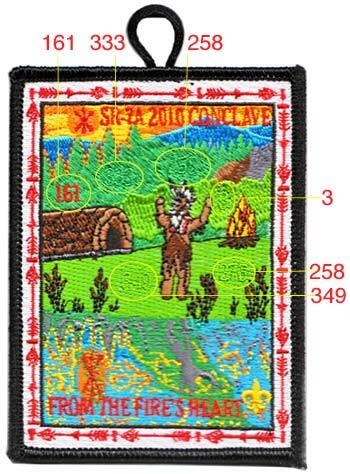 At the bottom of the patch the theme of the Conclave From the fire's heart is embroidered, along with a fleur d'lis. Surrounding the design are OA sash designs. Above is a picture of the pocket patch with annotations indicating the position of the various ghosted lodge numbers. 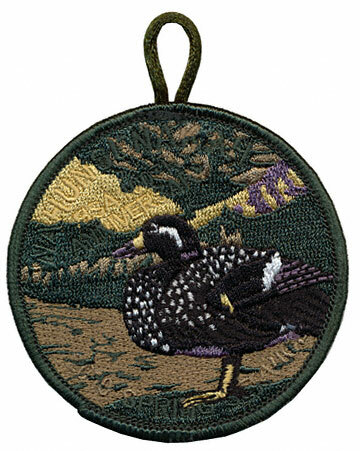 I've added the patch to the Section SR7/7A Emblems page, but still need pictures of other emblems that were issued at the conclave, including neckerchief, jacket patch, hatpin, Vigil rededication token, etc.